Pothole Patrol - WHAT COMMUNITY ASSOCIATIONS CAN DO TO MAINTAIN PAVEMENT. Home > Blog > Pothole Patrol - WHAT COMMUNITY ASSOCIATIONS CAN DO TO MAINTAIN PAVEMENT. No asphalt or concrete surface will last forever, but these pavement maintenance and repair options can be your best bet for longevity. Cracks in the asphalt should be cleaned of dirt and vegetation and allowed to dry completely before filling. Cracks should be filled with emulsified asphalt slurry or a light grade of liquid asphalt mixed with fine sand. 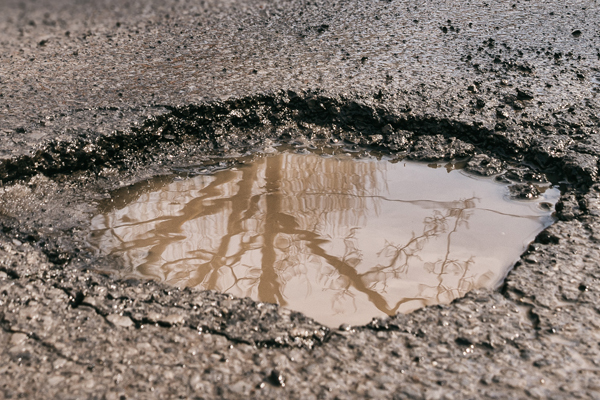 Patching is done in areas with severe alligator cracks or potholes. When the patch is cut out, the sub-base material should be examined and compacted thoroughly before patching. The patch should be tack-coated, to ensure firm bonding between the old and new surfaces. Base course material is laid and compacted first, and new surface asphalt is laid and compacted on top of that. The patch should be rolled to a smooth finish, and all edges should be coated to minimize water penetration. Overlays are placed over existing asphalt to create a new surface. In recent years, paving fabric, placed on the existing asphalt prior to the overlay, has gained popularity as an effective agent to bond the new asphalt to the existing asphalt surface. Once the existing asphalt has been prepared, the paving fabric is laid down and a new surface quality asphalt is laid over it. It is then rolled to a smooth finish to match existing grades of asphalt. Sealcoating is a controversial aspect of asphalt maintenance. Generally, sealcoating provides an additional 2-3 years of protection against the elements and use by providing an additional layer of protection. It is also cosmetic, in that it covers old and new asphalt to create a uniform look in the community and increases curb appeal. Sealcoating is best done approximately one year after a new surface has been laid. It should be applied by the squeegee method if possible to ensure the sealing of cracks too small to fill by the traditional method. For more information on repair road and paving, check out The Road Repair Handbook, available for purchase at CAI Press. This article was originally featured in our blog, Ungated. Subscribe today.